The following steps will guide you through gaining access to BU-GUEST. 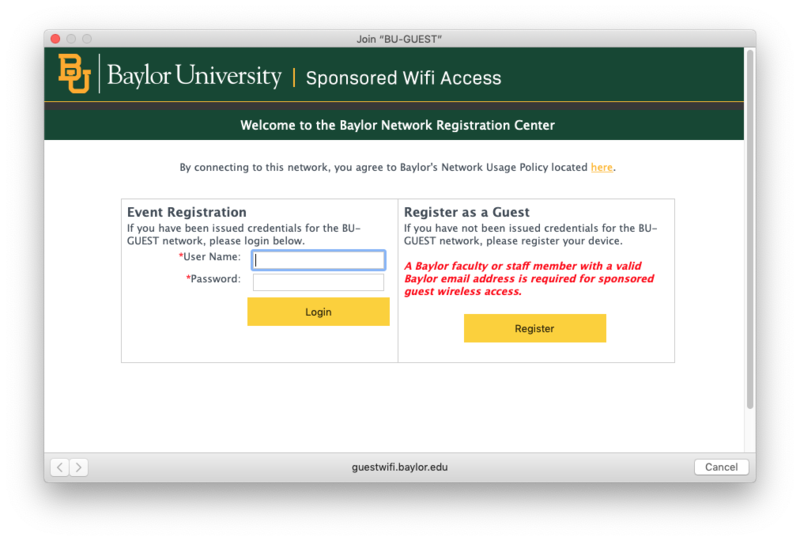 If you are at Baylor as part of a conference or event and have been given a BU-GUEST user name and password, enter those credentials in the fields provided and select Login. If you are simply visiting Baylor as a guest and have a faculty/staff sponsor, select Register and move on to step three. Complete the online form and select Complete Registration. Be sure that you enter your sponsor's Baylor email address correctly (First Name_Last Name@baylor.edu). If the Baylor email address is entered incorrectly, you will have to contact the HELP desk for assistance.If you do not have a valid, Baylor email address of a faculty/staff sponsor, you will not be able to access BU-GUEST. Enter the validation code that you will receive via text message and select Complete Registration. Once your faculty/staff sponsor authorizes access to BU-GUEST, your device will notify you that it is connected to the wireless network. If you have any questions about BU-GUEST access, please contact the Help Desk at 254-710-4357. If the HELP Desk is closed, please contact TechPoint at Moody Memorial Library at (254) 710-8324 (TECH).